With Brexit at the forefront of the 2017 UK election, investors across Europe are watching the conversation closely. At stake is $240 billion in trade, and approximately 44 per cent of the UK exports, which comprised almost 12 per cent of the value of the British economy in 2015. That figure has been at around 13 to 15 per cent over the last decade. In 2016, 53 per cent of imports into the United Kingdom came from countries in the European Union. The share of UK goods exports going to the EU has been trending downwards for the past 15 years as the rest of the world has grown at a faster pace than Europe – yet the share going to the Continent seems to have stabilised at about 45 to 48 percent since 2014. For example, according to the Office for National Statistics, total goods exported in May 2017 were £23.7 billion. Of those, £11.4 billion (48.4 per cent) went to the European Union. When goods and services are sold across borders they can face barriers including tariffs (taxes applied only to imports), limits on the amount, and standards that are different from those in the seller's domestic market. This does not mean countries cannot trade. However, it does make doing so more costly and more challenging. The rules on trade in the future will depend on the agreement the UK is able to reach with the EU following its departure from the union. Trade in services will be of particular importance, given that approximately 80 per cent of the United Kingdom's economy comes from providing services. If no new trade deal is negotiated and trade takes place under World Trade Organisation rules, the United Kingdom would have to pay tariffs and face other barriers to trade. For 2015 as a whole, services exports to the EU were worth £88.9 billion – 40 per cent of all services exported. Pro-Brexit advocates argue that the UK’s chronic goods trade deficit with Europe will put pressure on the European Union to do a rapid trade deal. This is especially true given that the United Kingdom is a major sales market for European goods and they will want to safeguard their own exporters’ interests. In the first quarter of 2016 it is estimated that UK services exports to the EU amounted to £23.5 billion. 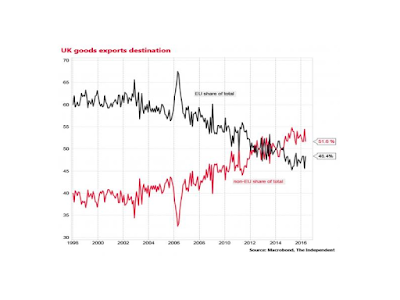 Aside from markets in the European Union, retailers and manufacturers in the United Kingdom will have to also look overseas to discover additional markets to sell their goods/services. This is strongly recommended regardless of whether there is a soft or hard Brexit for the UK.